We’re sorry, this page is not correctly translated in English yet. A braiding technique that dates back to the bronze age. Alas, the technique is as good as extinct in the Netherlands but Blue does the best she can to pass on the knowledge of this technique by giving demonstations and teaching all who want to learn. An other very old technique for which al you need is a needle and thread. 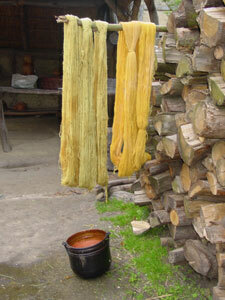 Dying wool with plantmaterial is a regularly returning activity for most reenacters. It’s fun to try this yourself. Here we collected some information about dying wool with unionpeels for example. Through our living history we came in contact with mead. Vikings didn’t have grapes, but they knew how to make a special alcocolic beverage using yeast and honey. A very old form of weaving is tablet weaving. You don’t need a loom, but only cards with holes. Tijdens de slag bij Vlaardingen heeft u mij de naaldbinden techniek laten zien. Ik wil dit graag gaan proberen. Maar nou ben ik op zoek naar een naald. Helaas helpt Google niet bepaald mee. Kunt u mij vertellen waar ik een naald kan kopen? Ik haal mijn naalden altijd op verschillende vikingmarkten. Ik zou zo via internet niets weten. Je kan het ook proberen zelf te maken. Hiervoor kan je bijvoorbeeld een oude tandenborstel gebruiken.